A wheat berry, or wheatberry, is a whole wheat kernel (except for the hull/husk), composed of the bran, germ, and endosperm. Botanically, it is a type of fruit called a caryopsis. 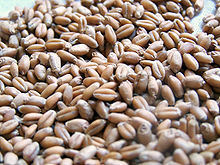 Wheat berries have a tan to reddish-brown color and are available as either a hard or soft processed grain[clarify]. They are often added to salads or baked into bread to add a crunchy texture. If wheat berries are milled, whole-wheat flour is produced. Wheat berries are the primary ingredient in an Eastern European Christmas porridge called kutya. In France, cooked durum wheat berries are commonly eaten as a side dish instead of rice or corn. 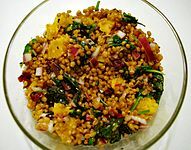 This side dish is often called ebly, from the name of the first brand of prepared wheat berries. ^ The Complete Guide to Growing and Using Wheatgrass: Everything You Need to Know Explained Simply. Atlantic. 2010. p. 132. ISBN 9781601383396. ^ James D. Mauseth (2014). Botany. Jones & Bartlett Publishers. p. 223. ISBN 978-1-4496-4884-8. Perhaps the simplest of fruits are those of grasses (all cereals such as corn and wheat)...These fruits are caryopses. This page was last edited on 27 December 2018, at 14:04 (UTC).